Estonian National Museum. Photo propaganda, courtesy DGT. Born in 1979 and now based in Paris, Tsuyoshi Tane is one of Japan’s leading young architects. 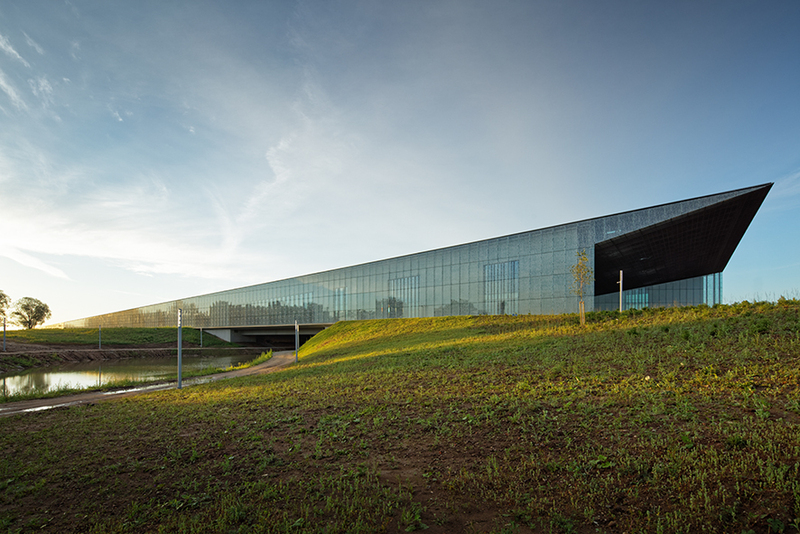 He shot to fame as a member of the office DGT Architects, co-founded with Dan Dorell and Lina Ghotmeh, when they won the competition to design the Estonian National Museum in Tartu. 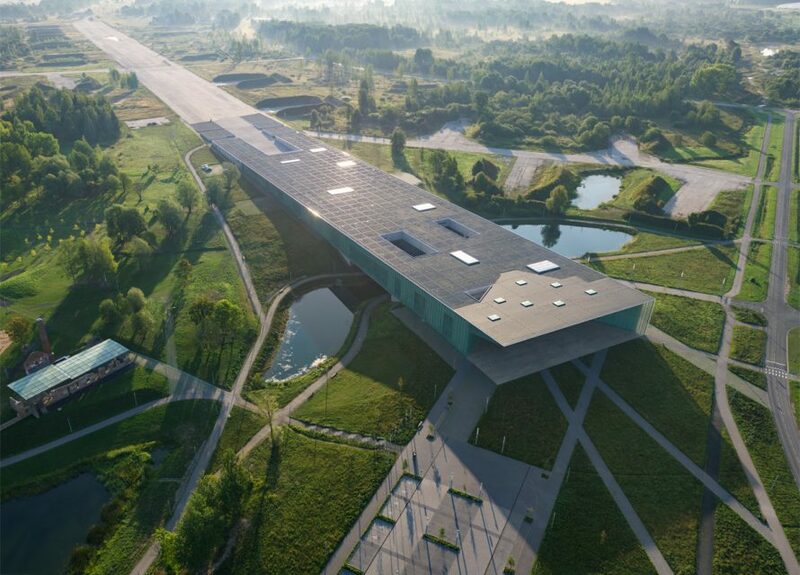 Completed in 2016, their design integrated the museum into the conditions of the existing site, which used to be an airfield in the Soviet era. Since then Tane has founded his own firm Atelier Tsuyoshi Tane Architects, and worked on projects ranging from private homes to museums, retail and lifestyle centers and exhibition design. His work was recently celebrated in Tokyo with simultaneous exhibitions at two venues in late 2018: “Archaeology of the Future—Digging & Building,” held at Tokyo Opera City Art Gallery, and “Archaeology of the Future—Search & Research,” at Toto Gallery Ma. ART iT met with Tane in July 2018 as he was preparing the exhibitions to discuss his ideas about architecture and his development as an architect. “Archaeology of the Future—Digging & Building” was on view at Tokyo Opera City Art Gallery from October 19 to December 24, 2018. “Archaeology of the Future—Search & Research” was on view at Toto Gallery Ma from October 18 to December 23, 2018. ART iT: Architecture has had a complex relationship with power throughout its history. Whereas previously the major patrons of architecture might have been the king, the nobility or religious organizations, now the major patrons are the state and private corporations. I’m interested in how architects negotiate those influences today. How have you developed your own sense of ethics as an architect, and how do you see it developing in the future? TT: To me, the answer to this question is simple. Where in the past it was the king or religion or state that had power over architecture, that’s no longer the case now. Today it is about the people. I work for people, not for the state, and not for corporations. I do not work for an ideology or for the vision of a single person. Architecture requires a lot of negotiation and dialogue – we work as a team to develop a vision in collaboration with the clients. I’m interested in the idea of making public space. I don’t want to control the people. Nor do the clients want to control people. They want to communicate with the people to show them how they can enjoy or inhabit or be part of the space. That’s why the clients need to share their idea or vision with an architect – because they cannot realize it on their own. 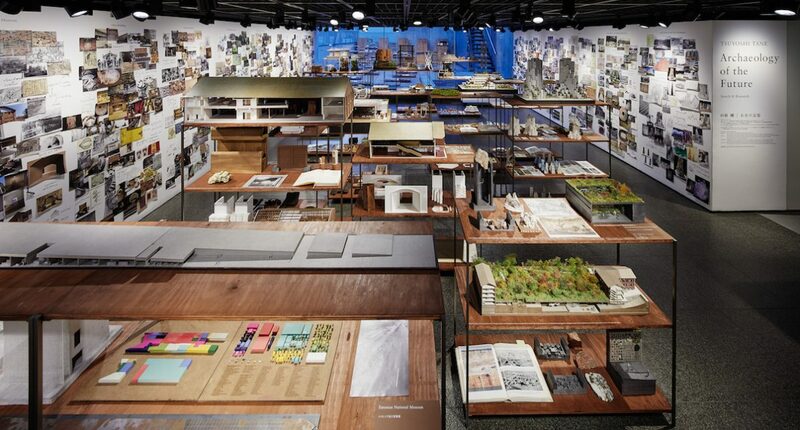 Architects can push the initial idea further to realize it as a physical experience. ART iT: But urban space is increasingly monetized and homogenized by the pressures of the market economy. Is that something you can address as an architect? TT: This is a radical social change that started happening in the 20th century. Capitalism and the market system have had a major effect on how we produce space. We now produce space based on economic structures that determine how much space we can have and how to use it according to what timeline – think about bank loans, for example. I would say that since the 20th century we have produced a huge quantity of spaces – more than anyone imagined could be possible – but we have lost our sense of place. Place is a singular point. You cannot reproduce or replicate it. You cannot replace one place with another place. To me, architecture is more about place than space. A designer or an artist can make a nice space, and a construction company can certainly make a building without an architect. But an architect makes architecture in a place. I prefer to make one place for one situation, rather than mass-producing spaces that can be put anywhere. Estonian National Museum. Photo Takuji Shimmura, courtesy DGT. ART iT: Usually a young Japanese architect will work for a bigger architect and then start making houses or smaller projects before establishing their own practice. In your case, you started your career with a major project, the Estonian National Museum (2016), which you designed with Dan Dorell and Lina Ghotmeh. Did you think about how the people in Estonia would relate to the museum both as a space and as a place? TT: Right, usually when we’re born we have to learn how to crawl before we can walk on two legs and then ride a bicycle or drive a car. In my case, we took a rocket straight to the moon, and we’re not sure how to get back down. When we started the National Museum project, I didn’t even know how to run an office or write an invoice. It was a strange feeling. In working on the museum it was important for us that the architecture should integrate the idea of not only the building itself but also the history of Estonian culture, from its past to its present and future. Whereas modernism emphasizes the idea of inventing new ideas and new designs to create an architecture for the future, we wanted to make something for contemporary society that could lead to the future while also learning from the past. Doing the National Museum project taught me to think about architecture in archaeological terms. We can excavate the past to learn from experiences that might have been forgotten or erased from contemporary society, and then use that archaeological memory to create a place for future generations. ART iT: Modern architecture was conceived for a universal subject – which actually turned out more or less to be the typical European white male, but at least it was a universal subject. The challenge of postmodern or contemporary architecture is to think about diversity and a multiplicity of subjects with different body types and ways of being who will all use the same space. Is that something you considered when you designed the National Museum? TT: Modern architecture spread the principles of comfort, efficiency and the rational organization of space around the world, and this kind of architecture was also supported by the economic conditions defining the production of space. Many countries were influenced by modern techniques for producing and scaling space or even making materials. But that came with the loss of local traditions that responded to the local environment. At the same time, many modernist projects are getting old and now being torn down and replaced. Seeing that happen was a big shock, and led me to question whether modernism was really the right way to produce our societies and way of life. There are many different ideas of comfort, for example. In the summertime it can be hot and humid outside while inside it will be cold and dry, and these sudden, extreme changes in climate are not good for our bodies. So there’s a contradiction inherent even to the modern idea of controlled comfort. I think the challenges for architects today are to deal with the contradictions left by the modernization of society, and to explore the different ways we can plan for life in the future. Of course, how we live is also heavily influenced by globalization and the new information economy. There are unprecedented numbers of people on the move, and many people belong not just to one society but to multiple societies. This is a very challenging condition for architects to respond to. But that’s why I think there are many opportunities for architecture today. We can make architecture about uniqueness instead of making a standardized modern society. Installation view, “Archaeology of the Future—Search & Research” at Toto Gallery Ma, Tokyo, 2018. Photo Nacasa & Partners Inc.
ART iT: The interior of the National Museum opens up with a series of large volumes. Was that one way to incorporate diversity into the building? TT: I think of architecture more in terms of specificity than diversity or modernity. The specificity of the National Museum can attract people from all across the world to come to Estonia. The idea for the building came from the site, which was used as an airfield during the Soviet era. The entrance grows out of the flat concrete of the airstrip, so when you enter the space you are not able to anticipate what is happening in the back of the building. The entrance has a big canopy that welcomes people from different directions and leads into a space with really high ceilings. It’s an open, public space with no walls, so you can walk around it as if you were in an urban space like the street or the market. There are many events that happen in this public area. Continuing to the exhibition area, you follow a long timeline of Estonian history, but instead of starting with antiquity, the timeline begins with contemporary Estonia: the first object you see is the office chair of one of the original programmers of the Skype software. Then the ceiling gets lower and narrower as you progress back to the Stone Age, after which you suddenly emerge out to the airfield to discover an almost infinite nowhere space between the concrete strip and the forest. We designed these transitions from dramatic space to empty space to also show how the museum builds upon the airfield. ART iT: I read that one of the complex aspects of Estonian society is that there is now a population of Russians who remain from the Soviet period, which means that the former colonizers are now an ethnic minority. That must make it a challenge for the museum to project a vision of Estonian unity. TT: When we came up with the initial design for the competition, we were simply really excited to use the airfield as an element of the architecture. The runway is about one kilometer in length, and we wanted to connect it with the museum to make a huge, 1.5-kilometer-long building – something that had never been done before. But after we won the competition, we learned that the Estonian people saw our design as a vision for how to integrate the history of the Soviet occupation into Estonian society. Our proposal showed them the possibility for giving new meaning to a painful history, rather than erasing it from the national memory. ART iT: My impression is that many Japanese architects try to avoid the idea of architecture as a symbol in the pursuit of pure architecture, but actually we can’t discount that architecture has a major symbolic function. TT: Yes. In the case of Estonia, we were dealing with the idea of the nation, but didn’t want to let the building become an expression of nationalism. Our focus was on the long tradition of one generation passing their memories on to the next generation, and then that generation passing their memories on to the next after them, or the way that people connect to each other through traditional objects, motifs and thinking. For us, thinking about those continuities was more important than creating a symbol of the nation as such, and that guided our approach. As for the pursuit of pure architecture in Japan, I think it’s a reflection of the education system. Architecture programs here uphold the idea that architecture should stand on its own and that it doesn’t have to deal with social, economic or national politics. Ironically, that focus on purity is why are seeing all these great buildings by Japanese masters getting torn down these days. There’s no space to attach our traditional continuities to those buildings because they are too pure – so nobody cares for them. It’s very upsetting, but nobody wants to keep them. It’s a tricky situation. 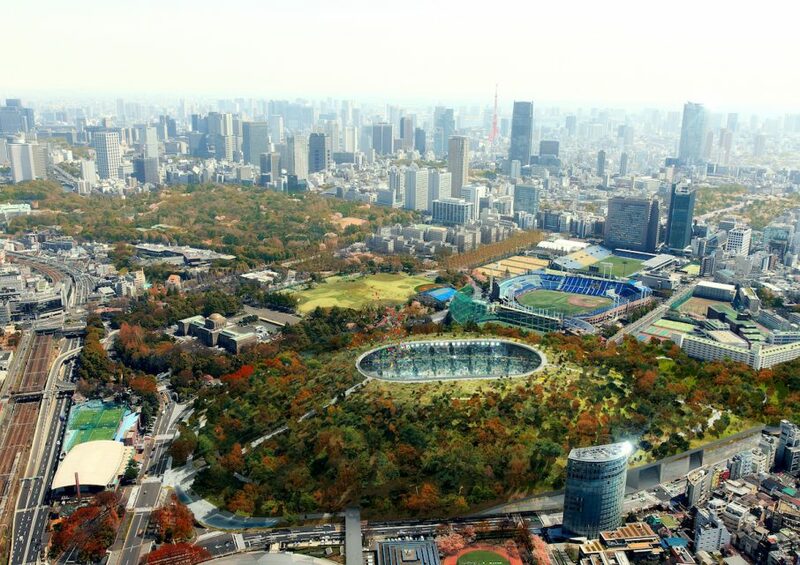 Kofun Stadium—New National Stadium Japan. Image courtesy DGT. ART iT: Yet programs like the government’s Cool Japan policy also position architecture as a vehicle for projecting Japan’s soft power to both foreign and domestic audiences. There are strong nationalist undertones to how architecture is discussed in Japan. TT: I think there is a tendency to simplify the complexity of individual projects when people try to make generalizations about Japanese architecture, and certainly that can be a bit irritating for the architects. But I still think it’s a good thing that the Japanese government and cultural institutions such as the Mori Art Museum are promoting Japanese architecture, because there is not much appreciation for it otherwise in our society. Big real estate developments and the massive production of space are the main characteristics of the Japanese construction industry. That’s not architecture – but it occupies so much of everyday life here in Japan. So even though I don’t always agree with how it is done, trying to talk about architecture is necessary for us to appreciate our culture, and allows people to recognize that Japanese architecture is doing something great today. Of course, there is still a lot more we need to do to improve conditions for architecture in Japan. There have also been many failures over the past 45 or 50 years. Many buildings designed by architects are too complicated or over-designed, so they don’t function, or they have leaks. Architects have taken our share of criticism in Japan, and we may have lost people’s trust, but we can still contribute to our society and culture. ART iT: I agree that exhibitions such as the Mori Art Museum’s “Japan in Architecture” show from earlier this year and the National Museum of Modern Art’s “Japanese House” show in 2017 are important for raising the architectural literacy of Japanese audiences. On the other hand, there’s a big disconnect between what is promoted as Japanese architecture and how most people actually live in Japan. TT: And not just people, but architects too! We work extremely hard – no life, no culture, no time to eat good food. That’s the life of an architect! We are trying to make great architecture, but our lives are so poor. It’s worrying that so few of the staff at architectural offices actually get to experience the richness of good design and how that can affect our experience of space. As a result, all everyone wants to make is a clean, pure space that looks really photogenic.